I was curious about some of the instruments, so I started looking them up on the internet. Below are two examples of the birbynė, a wind instrument originally used by shepherds. The ones below are made of wood with a bell at the end of horn. The kanklės is a Lithuanian plucked string instrument, like a zither. As can be seen with the figurines, they come in a variety of sizes and shapes. The skrabalai is a percussion instrument consisting of trapezoid-shaped wooden cowbells of various sizes arranged vertically in several rows. The instrument is usually made of oak or ash and is played with two wooden sticks. 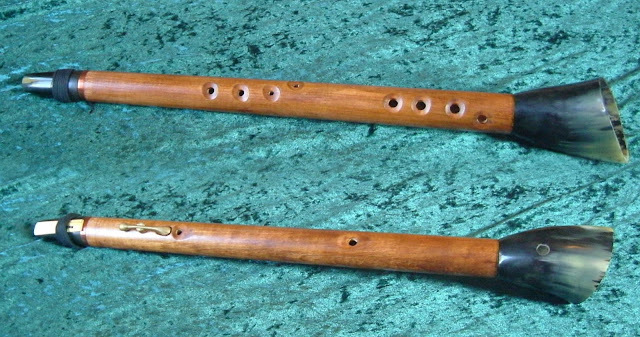 The skudučiai are panpipes made of wood, bark, or hollow stems.